A huge percentage of school-based learning is achieved visually. Yet interestingly, in spite of this overt link between sight and learning, a lot of people don’t seem to be aware of how common vision problems are, and as a result, don’t include a visit to the eye doctor as part of their child’s back to school medical check-up. 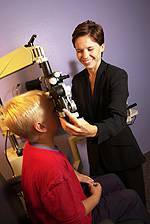 As your child’s vision may change frequently, regular eye care is crucial to good school results and self esteem. As children go through school, it becomes even more important to keep an eye on their vision. Some warning symptoms include reversing numbers or letters, watery eyes and frequent eye rubbing, extra close reading distance, head tilting, and avoiding detailed work. Struggling to meet the visual demands of schoolwork may noticeably affect their academic performance. Recently developed educational technology, such as interactive whiteboards, can sometimes heighten less obvious vision problems. If a student doesn’t have good enough vision, it isn’t just their performance at school that suffers. It’s mentally and emotionally challenging for them too. If you’re the parent of a glasses-wearing child, now is a great time to see if their prescription is still adequate. Even when a child can see well with his or her older glasses, the fit may be wrong or perhaps the lenses no longer align with the child’s eyes due to normal growth. The more your child feels comfortable wearing his or her glasses, the more they’ll be worn! Find a good time to stop by to see us when you’re getting your kids prepared for their year. We’ll do our very best to help all the children we treat begin the new school year with excellent vision.